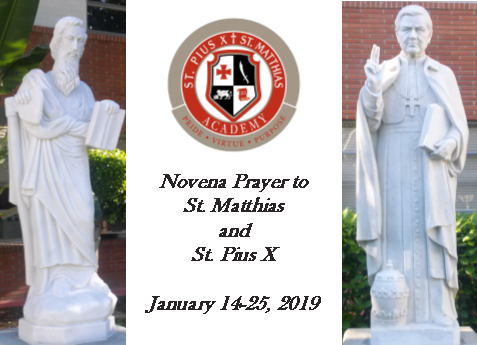 This week we begin our annual Novena to St. Pius X and St. Matthias seeking their intercession for the intentions of our PMA community, continued growth in school enrollment, and especially for the 8th graders are preparing to take the HSPT exam on January 26th & February 9th. Please join us in praying this Novena beginning on January 14 thru January 25th. A Novena is a devotional act consisting of private or public prayers repeated for nine successive days in belief of obtaining special intercessory graces. The 9 days signify the 9 days between the Ascension of Christ into heaven when the apostles and Mary gathered to pray for the coming of the Holy Spirit, which came to them nine days later at Pentecost. Glorious pope of the Eucharist, St. Pius X, you sought “to restore all things in Christ.” Obtain for us a true love of Jesus so that we may live only for Him. By your love for Mary, mother and queen, inflame our hearts with tender devotion to her. Blessed model of the priesthood, obtain for us holy, dedicated priests, and increase vocations to the priesthood and religious life, especially among our students. for success to the work of our hands if it should lead us and others to a more profound union with Christ Our Lord. for God’s blessings on our families and school community, past, present, and future. St. Joseph Pray for us. St. Pius X Pray for us. St. Matthias Pray for us. St. Julie Billiart Pray for us.